Oscar Wilde essays discuss the literary career of Irish born playwright and most celebrated author in 1890s London, Oscar Wilde. Oscar Wilde (1854-1900) was an Irish born playwright and poet, one of the most celebrated authors in 1890s London. In literary circles, he is largely remembered for his novel, The Picture of Dorian Gray, and his play The Importance of Being Earnest. While he was the toast of London society, Wilde was arrested, tried and jailed for being a homosexual, dying a broken man exiled from his home. Wilde was born in Dublin to wealthy parents, and learned French and German as child. He attended Trinity College, Dublin, from 1871 to 1874, winning the schools Berkeley Gold Medal and a scholarship to Oxford. During his time at Oxford, Wilde became known for his participation in the burgeoning aesthetic and decadent movements, growing his hair long and creating his self-made myth. In 1882, Oscar Wilde spent the year on a speaking tour of the United States, where his aesthetic tendencies were often mocked in the press. In 1884, he married Constance Lloyd; the two had two children, Cyril and Vyvyan. The Picture of Dorian Gray appeared in 1890, and Wilde divided his time between London and Paris. In 1895, Wilde charged the Marquess of Queensbury with libel. The resulting investigation saw Wilde charged with indecency (for being homosexual). After several trial, Wilde spent time in prison, the harsh conditions of which affected his health. He died penniless in Paris in 1900 and was buried at the Pere Lachaise Cemetery, where Doors singer Jim Morrison would later be buried. Oscar Wilde Plays essays examine the plays of one of the most celebrated London playwrights of the 1890s. 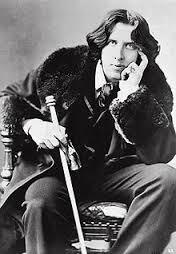 Oscar Wilde Poems essays discuss his literary career and examine the popularity of his poetry. Victorian Literature research papers discuss the literature created during the 19th Century Victorian Era. Paper Masters writes custom essays on Oscar Wilde and discuss the literary career of Irish born playwright and most celebrated author in 1890s London, Oscar Wilde.